FAILE Sets the Bar For How Art Books Should Be Made With Their New Release "Works On Wood"
Brooklyn-based art collective FAILE have more than earned their stripes, not only in the street art world, but as fine artists who have changed the rules and created their own lane. The idea of existing in a space between high and low culture has become a cliché that every street artist with a gallery show uses, but Patrick Miller and Patrick McNeil were doing it before it was cool. The duo formed FAILE back in 1999, and over the past decade and a half, they have transformed the culture of street art, drawing inspiration from their lives and the world around them and experimenting with materials, methods, and patterns to develop a visual style that is unmistakably FAILE. 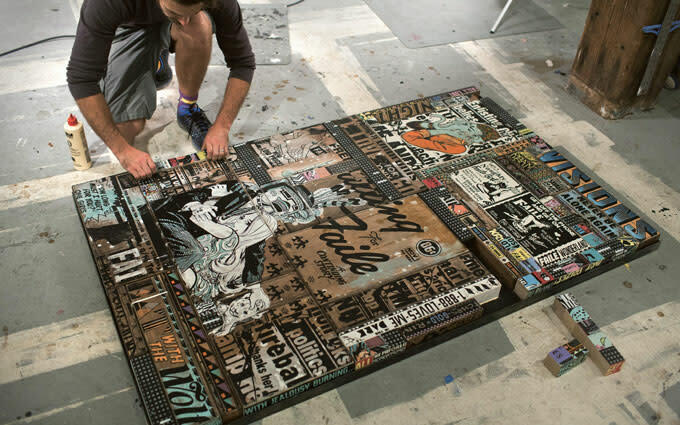 Faile: Works on Wood: Process, Painting, & Sculpture, edited by Ian Bourland, is the latest in a catalog of well-made books from the duo, released in conjunction with an exhibition at Allouche Gallery (Nov. 15 through Dec. 10). Published by Gestalten, the book mimics their 2010 monograph Faile: Prints + Originals, 1999-2009 in that it provides an in-depth look behind the curtain and into the artists&apos; studio and portfolios. 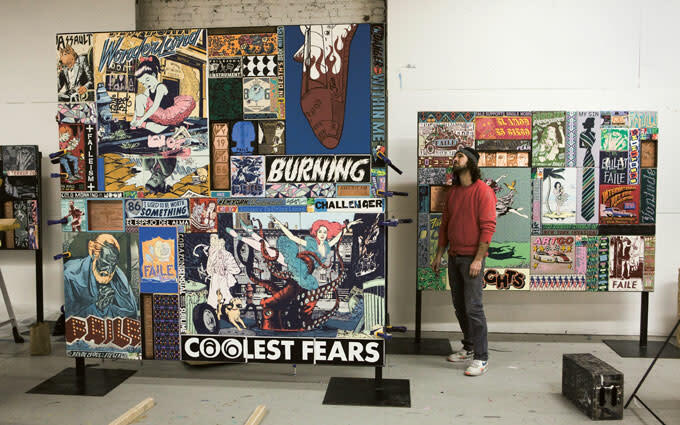 As the title suggests, the 320-page book focuses on FAILE&apos;s works on wood, including their early paintings on salvaged window frames, carved Prayer Wheels, and larger installations. The pages (which are made of paper certified by the FSC) feature large, vibrant photographs of the sculptures and paintings, including detailed images of the complex iconography that has become FAILE&apos;s signature. More than a treasure trove of beautifully printed photos of art, Works on Wood is a visual timeline of FAILE&apos;s career complimented by captions and blurbs written by the artists about specific works, exhibitions, and periods. From seeing the gentrification outside their Brooklyn studio, to finding an apple box by chance and deciding to print on it, to taking inspiration from quilts, the blurbs alone would make this book worth owning. The artists have also included essays about their work. The book answers questions that even the most insightful interviewers might not consider asking, reveals "secrets" about FAILE&apos;s process that other artists would keep heavily guarded, and shows the duo&apos;s growth as artists and men. In the introduction, Ian Bourland provides a a brief history lesson as a "jumping off to point," placing FAILE&apos;s work in conversation with the work of Modern masters like Robert Rauschenberg, Jasper Johns, Claes Oldenburg, and Robert Morris. 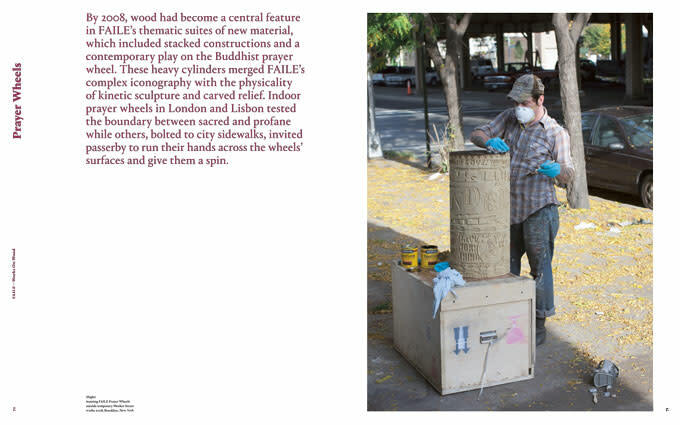 "While we can sketch here some important touchstones from the past," writes Bourland, "FAILE&apos;s work on and with wood marks a set of experiments that is both original and well suited to the present, blending digital design with analog assemblage, and building objects in real space that allows the viewer so much more than the visual dimensions of conventional painting." We strongly agree with his closing remark that most of FAILE&apos;s art is "best encountered in person, but this book is the next best thing." 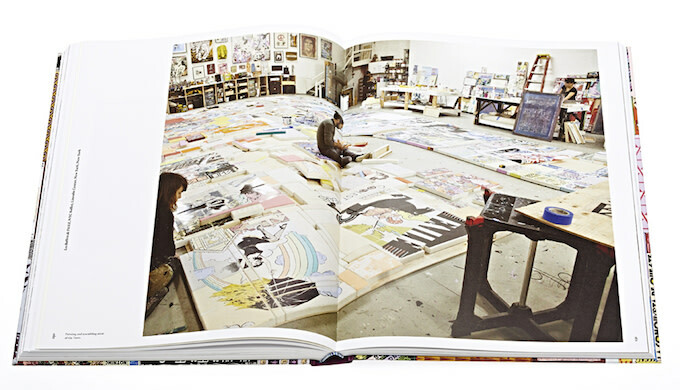 Grab a copy of FAILE&apos;s new book here.